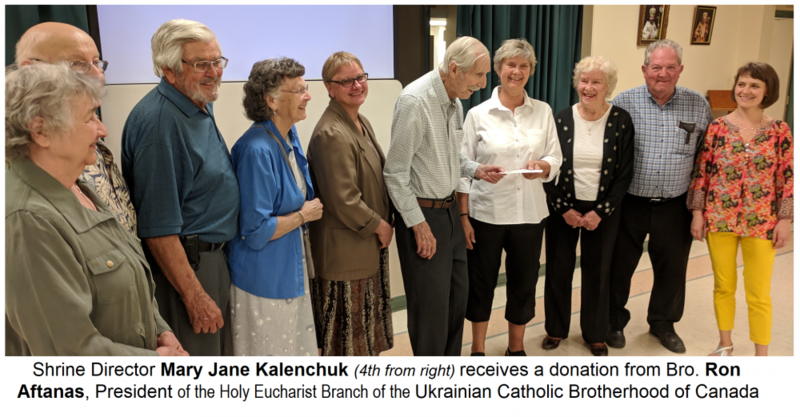 The Ukrainian Catholic Brotherhood of Canada - Holy Eucharist Branch, under the direction of President Ron Aftanas, organized the 16th parish pilgrimage to the Shrine of Martyr Blessed Vasyl Velychkovsky. The Brotherhood has been arranging the pilgrimage over the years to take place in the month of April or May, usually on a Wednesday evening to coincide with the Shrine's weekly public devotions. This year, as the parish pilgrims gathered, the Glorious Mysteries of the Rosary were prayed in English and Ukrainian. This was followed by a Moleben' prayer service to Blessed Vasyl' in St. Joseph Parish Church where the Shrine is located. Redemptorist Fr. Dmytro Dnistrian, C.Ss.R. led the service and preached a homily. Holy Eucharist Parish priest, Fr. Michael Kwiatkowski, who accompanied the pilgrims, concelebrated, while Redemptorist Provincial Superior, Fr. Larry Kondra, C.Ss.R. participated with the congregation. Lesia Sianchuk, led the Rosary payers and led the singers for the Moleben'. Immediately following the Moleben' Fr. Dmytro invited everyone to the Blessed Vasyl Chapel for a prayer and to venerate the Holy Relics of the Martyr and to receive an anointing with a special oil blessed with the relics. Fr. Michael also assisted wit the anointing. The pilgrims where then invited to the Shrine Museum and souvenir shop for a presentation on the latest research into the life of holy bishop and martyr. Everyone was delighted to hear amazing factual accounts from the life of the Blessed Vasyl - some recently uncovered. 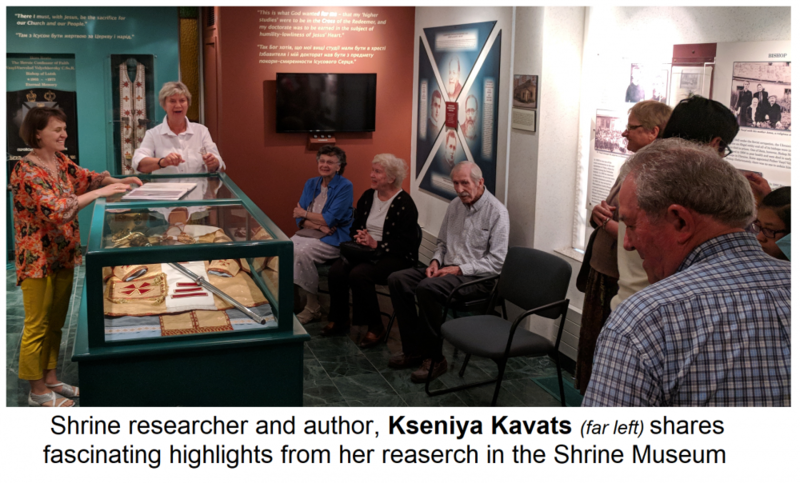 Shrine researcher and author (and enthusiastic fan of Blessed Vasyl) Kseniya Kavats shared some of the results of her ongoing investigation. She told not only of what the archive documents revealed, but the fascinating account of her research adventures together with other Shrine staff. 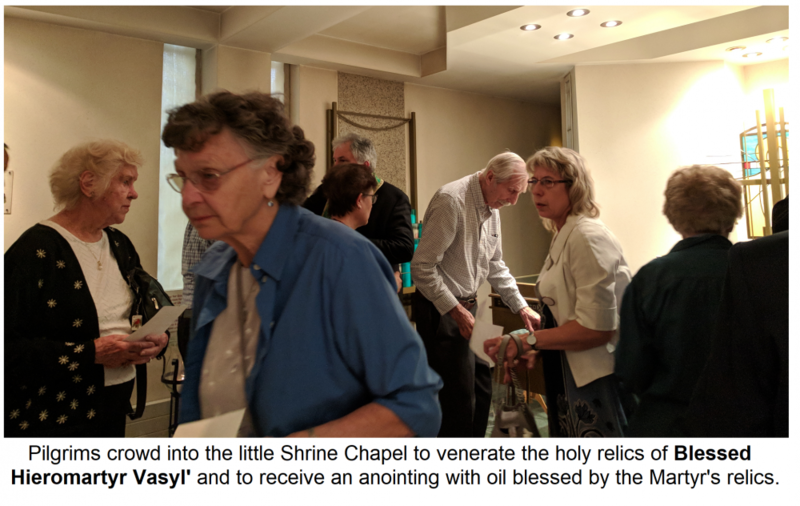 The Shrine hosted the pilgrims in the lower auditorium with pastries, juice and coffee, while Shrine Director Mary Jane Kalenchuk told of the pastoral missions of the Shrine that have extended from Canada to include Ukraine. They have become involved with Evangelization efforts, the helping of orphans and other ministries of healing and counselling. At the end of the evening, the pilgrims made their way back home very satisfied that they made the effort to come. They received the Lord's blessings through the intercession of Blessed Hieromartyr Vasyl and they heard new narratives about the life and times of Blessed Vasyl' that have come out the latest research. Blessed Hieromartyr Vasyl, pray to God for us! Блаженний священномученику Василію, моли Бога за нас!